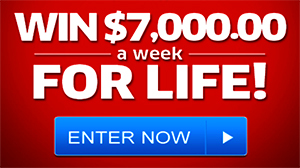 Win a car sweepstakes at www.cbs.com /shows/academy_of_country_music – CBS.com Ram Enter-to-Win Sweepstakes. CBS Interactive Inc. the sweepstakes administrator, prize provider is sponsering this marketing promotion where they offer you the chance to win the grand prize of their CBS “Win A Ram Truck Sweepstakes – Win A Car Contest”. Win a car sweepstakes have always been popular on our website, our readers love those kind of sweepstakes and this one is quite interesting. CBS Interactive Inc. wants you to win the grand prize of their CBS “Win A Ram Truck Sweepstakes – Win A Car Sweepstakes” a prize consisting of a 2013 Ram 1500 Truck and a also trip for 2 to Las Vegas, NV to attend the 2014 Academy of Country Music Awards – ACM Awards. The Vacation Sweepstakes Prize Package includes the roundtrip airfare, 2 night hotel accommodations, 2 tickets to the 2014 ACM Awards, and $500 spending cash money. Visit today CBS TV Shows Sweepstakes at cbs.com/shows/academy_of_country_music/sweepstakes and follow the on-screen instructions to enter the promotion. 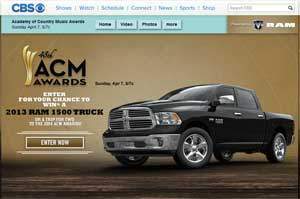 Enter CBS and Ram’s Enter to Win Sweepstakes and you could win a $45,000 grand prize of a 2013 Ram truck or a first prize of a trip to Vegas for the 2014 Academy of Country Music Awards. Frequency: one time per person.